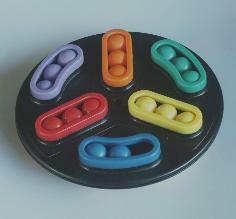 The Backspin puzzle is by Binary Arts (now called ThinkFun), but is also sold as Loophole under their XEX brand name. The body of the puzzle is a large circular disk, the two sides of which can rotate with respect to each other. Each side has areas in which balls of several colours can move about. There are three areas which run radially like spokes of a wheel from the edge to near the centre, and between them three curved areas along the disk edge. All these areas can hold at most three balls, so there is room for 6·3=18 balls on each side, or 36 balls in total. One ball is missing, creating a hole to which adjacent balls can be moved. A ball can move from one side of the disk to the other if the sides are rotated so that the hole and the ball are one in front of the other. Note that it is possible for a ball to move from a curved area to the outer position in a spoke on the other side, and vice versa. Each area has a colour, and the aim is to place each coloured ball into the area of that same colour. The missing ball is from one of the curved areas. There are actually only 9 colours, not 12, since the colours of the spoke areas on one side are the same as the colours of the curved areas on the other, but this does not make it very much easier to solve. Backspin was invented by Ferdinand Lammertink, and was patented on 22 December 1992, US 5,172,912. This leaves 36!/6!3/3!5/2 = 64,084,265,679,291,581,935,411,200,000 or about 6.4·1028 positions. ThinkFun homepage, the new name of the manufacturer Binary Arts. Java Backspin applet by Mark Sunter-Storey. He also has an Android app of it. This puzzle is not very hard to solve, once you do it in the correct order. I will not describe the solution in extreme detail, as that would only be confusing. The solution below is already difficult enough to put into words. Phase 1: Solve the 12 innermost balls. Suppose for a moment that the hole lies in one of the straight 'spoke' areas, and the two sides are rotated so they lined up. If you look from the side, the hole and the five balls near it form a standard 2 by 3 rectangular sliding piece puzzle. Therefore, if you can solve a regular sliding tile puzzle (14/15 puzzle) then you should also be able solve the inner two balls of all the spokes with little trouble. Choose one of the innermost positions which does not yet have the correct ball in it. Find a ball that belongs at that position, i.e. any one of the correct colour. Move the ball into one of the spoke areas on the other side of the position you are solving, if it isn't already in such an area. Move the hole also into one of the two areas. Rotate the disks to bring the two areas containing the ball, its destination, and the hole together. Rearrange it so that the ball goes to the correct position. Repeat the above method to solve all innermost balls, and then solve the middle balls of the spokes in the same manner. Phase 2: Solve the outermost balls. In this phase all remaining balls are solved, which are those in the curved areas, and the outermost ones in the spokes. These all lie on a circle. Find out which colour ball belongs in the position where the hole is now. If there is a ball of that colour on the other side which is incorrectly positioned, then turn that side to bring it next to the hole and push it through into the correct position. Repeat this as often as possible. An incorrectly placed ball of the wrong colour, but which belongs somewhere else on the side it is currently on. A correctly placed ball of the right colour. An incorrectly placed ball of the wrong colour, but which belongs somewhere else on the side that the hole is currently on. A correctly placed ball of the wrong colour.